Would You Wear Lonzo Ball's $495 Shoes? 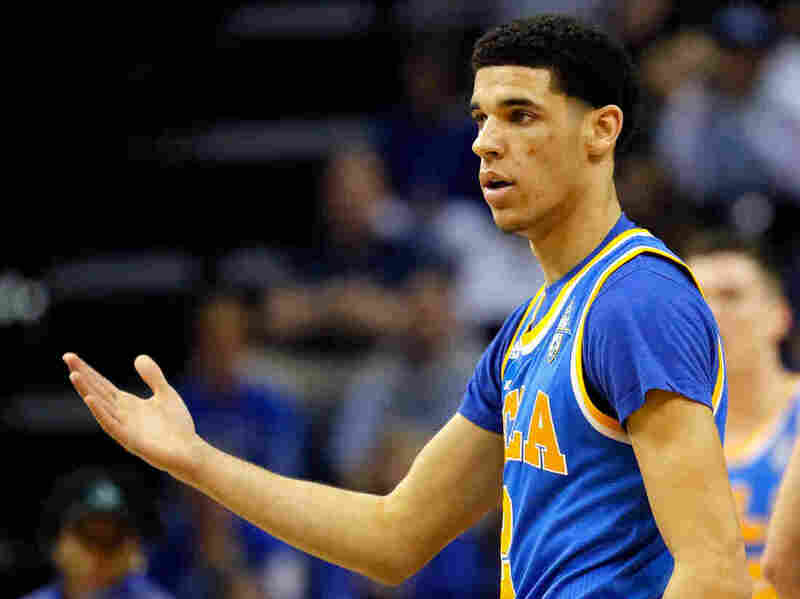 'Nah,' Twitter Says Politely : The Two-Way "The Sports World is Forever Changed," Big Baller Brand said in introducing NBA prospect Lonzo Ball's shoes — though some aren't exactly feeling moved. But wait, you ask, what about the $220 sandals? The soul behind the soles: former UCLA star — and potential NBA star — Lonzo Ball. Surely you've heard by now: Sports as we know it has changed forever. Go on, take a second if you need it. We'll wait here — but while we're at it, we'll leave this little reminder for the laggards who haven't heard what struck the decisive blow. Yup: a pair of shoes. A $495 pair of shoes. Fronted by a college freshman who helped lead his team to the Sweet 16 in the 2017 NCAA tournament. Or, if you'd prefer, you can select the $995 pair and get Lonzo Ball's John Hancock scrawled in gold right there on the shoe — though be forewarned, it remains unclear how much that pair changed the sports world, or for how long. Independence is Beautiful. We are proud to present the ZO2 Wet. The premium-priced footwear dropped Thursday afternoon, unveiled by his father LaVar Ball's punningly named Big Baller Brand just about a month and a half before the NBA Draft, where the younger Ball is widely hyped to be one of the top selections. It follows, then, that Ball also enjoys his fair share of hype as one of the NBA's top rookies-to-be. His future at the professional level is so bright, it practically shines like polished hardwood. In fact, it's possible he could very well be the next Lebron James or Stephen Curry (whose signature sneakers, by the way, top out at about $175 and $100, respectively). When balanced against that future, $495 seems like a steal ... right? OK, well, sure — Mike Brown coaches the Golden State Warriors, a championship contender that's not going to get the lofty draft position needed to nab Ball for its roster. Perhaps he's just jealous. Asked Friday why the shoe costs what it does, LaVar told ESPN Radio's The Dan Le Batard Show the matter was simple: "I figure that's what the shoe is worth," he said. "When you are your own owner you can come up with any price you want." ESPN reports that the Balls, who marketed the shoes themselves, were turned down by Nike, Adidas and Under Armour after the elder Ball declined standard endorsement deals. Still, they remain confident the shoes will earn a respectable return — and they're not alone in thinking the prices aren't as bad an idea as some on social media would have you believe. After all, if we discarded everything Twitter showered with snark, it's tough to tell what in the world we'd even have left. Probably not these $220 sandals, at least.